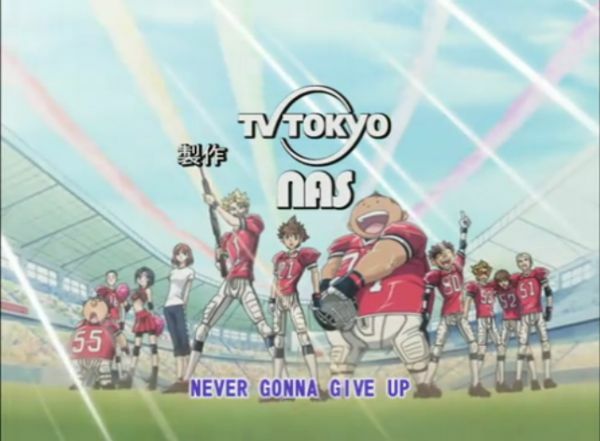 Screenshot from the anime Eyeshield 21, a recent sports anime. Like most of them, it’s about never giving up. OK, let me explain the weird title. You know that there are young people who shut themselves in their rooms and watch anime (Japanese cartoons) and read manga (Japanese comic books) all day. Well, more or less. I think that is quite understandable. Japanese serial art is quite advanced and there is a broader range of it than we are used to in the west. In Japane, it is perfectly normal even for housewives and old folks to read comics, as there are series for all kinds of people and all kinds of interest. For natural reasons, sports series are mostly enjoyed by the young. It typically has young protagonists, often in high school. There is some chaste romance, lots of comradeship, rivalry, and people finding noble motivations for doing their best. And of course there is the whole part about getting better and better. Just when you think you have reached the limit, some new challenge makes it necessary to become even better. Well, life is often like that when you are young. And later too, although it tends to involve work more often than sports for most of us. Now, there may be thousands of animated TV series, but I doubt any of them has ever been about walking. There are limits to how boring things you can make interesting. But the same principles apply. Last spring I decided to increase my walking from an hour on Saturday to an hour every other day, more or less. The thing that got me started was a couple scientific articles documenting that exercise at the level of fast walking could prevent and actually reverse cancer, as well as various other illnesses. So I began taking these walks regularly. I soon made it a habit to walk for an hour each day unless it was raining. After only a few weeks, I noticed that I had to walk longer than before to fill that hour – meaning I walked faster – and yet I burned fewer calories (according to my pulse watch). I joked that if this continued, I would eventually be able to move from one place to another just by thinking about it. Of course that is not how it works: Practice does not actually make perfect, but it still makes you pretty good. I had to run a few steps now and then to keep the pulse at the same level as it had been while just walking. In the summer, I met my first major challenge: Pain in my right foot. It grew rapidly worse, and for a while it was all I could do to get to my job and back. But after I moved, my foot healed rapidly and I began walking even longer, including over fairly large hills. I lost weight and my pulse got even lower than it already was. In fall, I ran into a more serious challenge. My heartbeat began to grow irregular some days, and one afternoon while I was out walking, my pulse increased to its maximum and stayed there for a while, even when I was resting. Luckily I was near a school and someone called an ambulance. So this was exactly the kind of dramatic turn that you would expect from an anime. What will our hero do now? Well, I went back to walking after some days, but without pressing myself as much as before. With the coming of winter, roads became slippery and I only walked when necessary. As soon as the ice left the roads, I started walking again. Recently, the heart palpitations have come back, and I have had two episodes of tachycardia (racing heart). I am on the waiting list to talk with a doctor and have some measurements of my heart while I am walking, hopefully. In the meantime, I am walking, but mostly for half an hour instead of an hour. Of course I am hoping that the story will progress the way any good anime should: Somehow we will get around the obstacle and I will continue to walk faster and faster, until I can run like the wind. OK, not really realistic with my exercise asthma, I guess. But I can sustain a combination of jogging and walking (mostly walking with brief jogs) already, so if I don’t have to worry about the heart, I should be able to train myself eventually to jog without triggering the asthma. That would be a lot of fun. Of course, another recurring theme in sports anime is where the hero dies and the real main character swears to take up his mantle and win to honor his memory and show that he made a difference in the world. I would rather prefer this story to not have that ending, as you can imagine! But in the unlikely case that you read this after my passing – well, there is always that. The world needs its heroes – even the world of walking. For now, I shall be quite happy to play my part though!